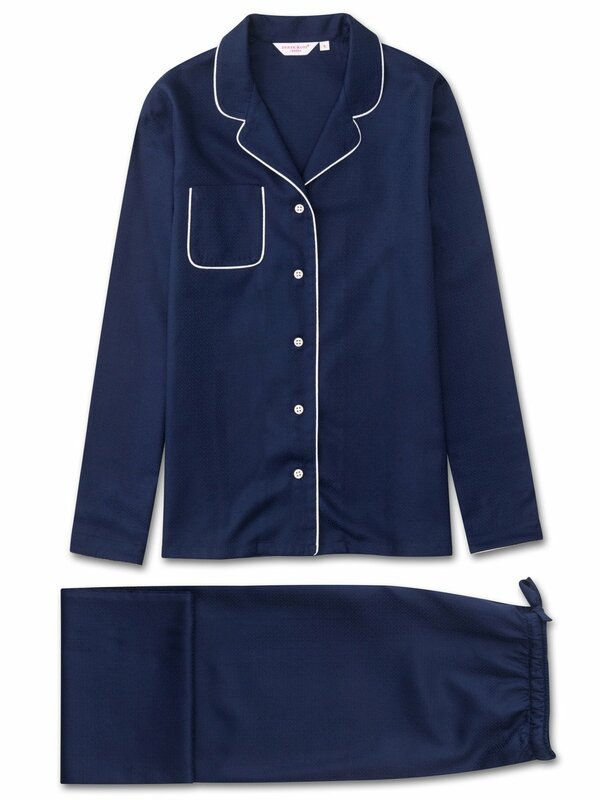 The Lombard 6 pyjama set has a subtle design allover featuring our signature rose logo. The intricate design is woven into the mid-weight fabric using a traditional jacquard technique to produce a layered and textured repeat pattern. With its satin sheen and touch, it feels as great as it looks. Made from 100% cotton, woven into a satin touch finish, the Lombard 6 is a mid-weight fabric, designed to keep you cosy and comfortable year round. The Lombard 6 jacket features a fully piped finish in a white trim, a single patch pocket and mother of pearl buttons. The quality of craftsmanship continues with the trousers and their elasticated waist with self fabric drawstrings for added comfort.